It's excellent. The full title is Christ-Centered Biblical Theology: Hermeneutical Foundations and Principles. The title/subtitle makes this one hard to distinguish from Gospel-Centered Hermeneutics: Foundations and Principles of Evangelical Biblical Interpretation. But while Gospel-Centered Hermeneutics is fundamentally about biblical interpretation, this newer book is focused on how the biblical storyline hangs together. The earlier book is how; this is what. With a bunch of overlap between the two. Graeme Goldsworthy is a retired Australian Bible teacher who was trained on three continents before a long teaching career at Moore Theological College in Sydney, Australia, during the decades when Moore was gaining an international reputation for its strength in biblical theology. You can sample some teaching of his here. The basic point of the book is straightforward. Goldsworthy wants to propagate the macro-vision of the Bible that he inherited from his teacher, Donald Robinson, when Goldsworthy himself was a student at Moore. (Side note: the tone of affection and sober admiration with which Goldsworthy speaks of Robinson is an edifying example of 2 Tim 2:2, and I found it moving). Genesis 1-11 thus sets the stage for redemptive history, which amounts to a rise up up up to Edenic-like glory with the building of Solomon's temple (itself an architectural recapitulation of Eden), followed by a decline down down down through the divided kingdom and wicked kings leading to exile, including the prophetic hope of new creation/new Eden, which is inaugurated at Christ's first coming and will be completed at Christ's second coming. An important point to Robinson and Goldsworthy is that the first of these three movements gives us all the categories that Christ would ultimately fill out; the second movement is then the prophetic hope of these categories getting filled out; the third is Christ himself and the fulfillment of these hopes. Lots to say. A few scattered reflections for the moment. 1. Simply fascinating. Goldsworthy writes clearly and sensibly. He does not try to mask confusion on his part by intimidating the reader with erudite-sounding language, nor does he press the evidence beyond what it can bear. At the same time he has a soaring vision of what the Bible is and the history it recounts--soaring because he sees Christ as the very point of both the Bible and history; indeed, of all reality. Really, it's more than a Christocentric hermeneutic; it's a Christocentric metaphysic, a Christocentric cosmology. 2. The significance of David to the NT writers has, I think, been not fully appreciated in biblical theology and NT theology. I have been wondering this for the past few years and this book underscores that suspicion. I wonder how we can give David his due prominence in NT theology. Goldsworthy was necessarily selective in which texts he brought forth (texts about David), but I don't think it was unfair representation. 3. The way Robinson and Goldsworthy use this broad storyline to argue for a future for ethnic Israel (without sliding into any form of Dispensationalism) is, to me, unconvincing. This view of Israel is partly due, in my opinion, to not seeing fully all that has dawned with Christ's first coming. Goldsworthy speaks at one point, for example, of the future Day of the Lord in which the ingathering of the nations anticipated in the OT would take place. In my view the Day of the Lord has decisively taken place (as Peter indicates in Acts 2), with only public manifestation and vindication still to come (as in e.g. 2 Tim 1:12). The ingathering of the nations has taken place too--though not with the nations streaming to Zion (Isa 2; Mic 4) but those in Zion streaming out to the nations. The attractional centripetalismn of the OT has become the missional centrifugalism of the NT, and ethnic Israel is itself now an object of missional preaching of the gospel. Goldsworthy seems better at this point in Gospel-Centered Hermeneutics, so perhaps I did not understand him rightly in this most recent book. 4. I think the significance of Noah and the Noahic covenant is (can be?) unduly sidelined in this schema. Pages 290-95 of Waltke's OT theology and Warren Gage's The Gospel of Genesis convinced me of the pivotal significance of Noah for redemptive history. 5. Helpful interaction with other biblical theologians along the way: Greidanus, Hasel, Vos, Clowney, Dumbrell, and Scobie, and more briefly D. Johnson and VanGemeren. Yet many are overlooked; understandably, perhaps, lest the book swell to unmanageable proportions. But how would the Robinson/Goldsworthy schema fit with what we find in Ladd, or Beale, or N. T. Wright, or Stuhlmacher, or Kline, or Chris Wright--to say nothing of Calvin or other significant pre-critical thinkers with a grasp of the whole Bible? I'm still digesting this proposal and its significance for how we put the Bible together but I find it very intriguing. My initial sense upon an unhurried reading of Goldsworthy's book is that he hitting on something that has not been sufficiently brought out in American and British biblical theology. At the same time I found myself thinking--"This 'epoch' description is faithful to Vos, but I'm not sure it is really fair to Clowney, especially since Clowney never wrote a definitive biblical theology." 7. Bottom line: fascinating thesis. Lots here to chew on. Wondering if the Robinson/Goldsworthy framework is as mutually exclusive with the more traditional Reformed reading as Goldsworthy implies throughout. He does acknowledge some overlap, but is there more? 8. If you want to know the heart of the book, read pp. 19-26, 79-80, 184-89, and 191-92. 9. Praise to God for wise, courteous, sober-minded, Christ-enthralled Bible teachers. Wow - thanks for this, Dane. Very interesting. Thank you for writing this. Dane, if I were contemplating reading a Biblical theology this summer by either, 1)Goldsworthy 2) Vos or 3) Beale, which one would you suggest I go through. 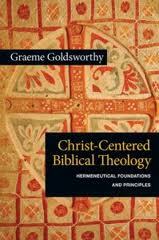 And if goldsworthy, would you recommend his Gospel-Centered work or Christ-Centered? Hey man. Prob Goldsworthy, either Christ-Centered Biblical Theology, (or According to Plan which should be read first). But if you were ambitious enough to work thru Beale's NT Bib Theo, that is the best one-vol. bib theo available, in my opinion. So if you want something in the 200-pg range, Christ-Cent Bib Theo; something in the 900-pg range, Beale. Hi Jason. Thanks for this. If someone hasn't read much in biblical theology I'd suggest Acc to Plan or Gospel and Kingdom. If they have, I'd suggest this more recent one. Dane, just started reading this book this morning. Thanks for the helpful comments. Its helpful to hear your interpretation at the outset.